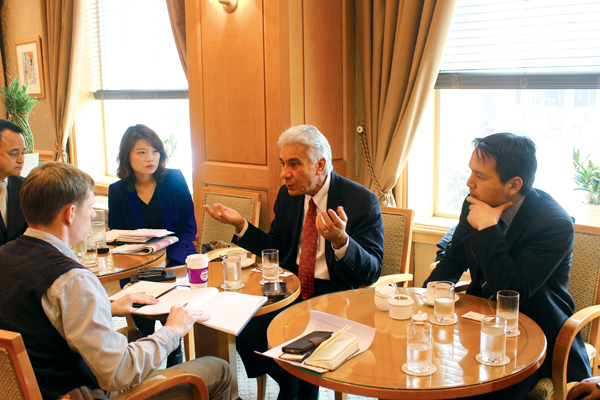 Charming, tanned and reassuring, Nikolaos Antalis looked every bit the cruise captain as he shared a coffee with The Weekly in a Shin Jeju hotel. The Greek, who saw his destiny on the seas after gazing into the Mediterranean as a child, was here to discuss the future of the local cruise industry with tourism officials. Having spent decades cruising, Antalis was now loving “the shore-side life” as the port captain of Marine Operations for Royal Caribbean International (RCI) based in Miami, Florida. He praised local authorities for their “proactive” work, but was cautious about what remains to be done. Antalis warned that facilities need to accommodate “bigger ships, more ships” to convince cruise lines that Jeju is ready for the next generation of vessels: “We need answers from the authorities, and sometimes we push too hard [but we want] a secure berth to bring in the cruise ships,” Antalis said. Preemptively heeding this advice, port facilities are getting bigger. The controversial Civilian-Military Port at Gangjeong will be able to simultaneously accommodate two 150,000-ton ships after completion in 2016. This more than doubles current capacity, which includes simultaneous docking of two 50,000-ton ships at Jeju Outer Port, Jeju City. Three cruises a day can berth at the current port when calls are split between morning and afternoon, amounting to over 11,000 passengers in the Voyager class. The port can also accommodate the 138,000-ton Mariner of the Seas, the biggest ship to visit Korea. RCI sees Jeju as the regional hub and it is firmly part of their plans, but Antalis hopes ports can work in advance with cruise lines to ensure infrastructure and services are at the desired level. “We come knocking once, twice, three times, then we go somewhere else. But I don’t think that will happen [in Jeju], especially with the ideas that are coming. I ask them to keep in mind the future. How many passengers can we accommodate on this island? 10,000, 15,000, 20,000? Good, then we should have the facilities to ... handle 20,000. Then the cruise lines will work with that,” he said. 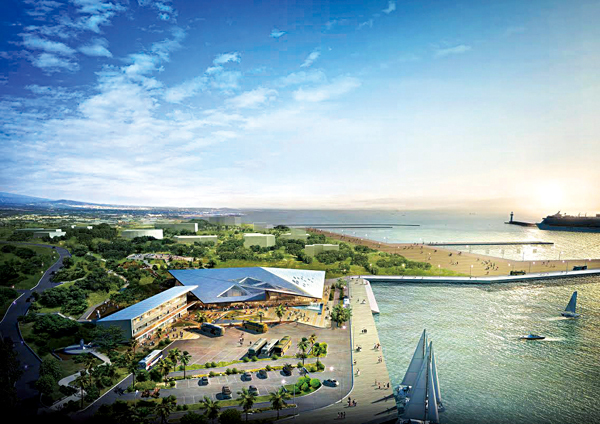 Antalis brushed off the suggestion that the centerpiece of the development plans, the contested naval base at Gangjeong, will damage the Jeju brand for cruise passengers. He believes it is “not an issue” and points out that passengers “love” seeing the naval facilities at other dual military-civilian ports across the world. He also saw little environmental threat from the developments in the soon-to-be world environmental capital. “Cruise ships are much better than shore side destinations [in recycling waste]. Because of the challenges we have ... with thousands of passengers, they have got that message and are improving. They have invested millions of dollars and have an excellent recycling and [emissions reduction system] system,” he said. Antalis was joined by Jianfeng Tong - “my mentor, my son, my friend,” said Antalis - the deputy general manager for Port Operations and Product Management based in Shanghai. He also praised the recent growth, recalling earlier days. “I still remember back in 2009 when I came, and that time there was only around 20,000 [annual] guests and no infrastructure and the new cruise terminal was not built. We were the ones expecting 250,000 visitors in five years time and you can already see this with the new cruise terminal,” he said. China is the source of this growth and Tong said he is “very, very positive” that the market will lead to “huge opportunities for Jeju.” The island is popular not only for geographic reasons, just a few hours from Shanghai, but for the food, history and culture. Altogether, they make Jeju ideal for short itineraries and Tong believes local government support has helped. The new port at Gangjeong, he continued, should address this with shuttle buses, integrated transport systems and on-pier tourist information centers. The goal is convergence and convenience: “If the guests have no complaints ... for us it is heaven,” said Antalis. Antalis’ parting shot was a warning, sweetened with a promise. His optimism even surprised himself: “You see what happens when I drink good coffee,” he joked.